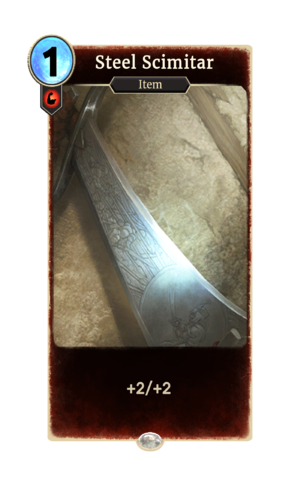 Steel Scimitar is a common Strength item card. It is part of the Core Set. In addition to the card's availability in the Core Set, two copies are included in the Warriors of Hammerfell deck. One copy is also obtainable in the Band of Survivors deck as a potential reward from Bandit Ambush. A card named "Shimmering Scimitar" previously used this card's artwork, but the card became "Sentinel Battlemace" and was given new art.